888 Holdings and Rank have withdrawn a proposed three-way tie-up with William Hill. 888 Holdings said they had not been able to "meaningfully engage" with William Hill's board and would no longer make an offer for the company. Rank and 888 made two £3bn-plus approaches for William Hill, both of which were rejected. William Hill noted the withdrawal and said it continue to focus its own strategy. The two companies initially offered 339p a share which William Hill turned down. They then returned with 352p, which William Hill called "highly opportunistic" and said it continued "to see no merit in engaging with the consortium." Itai Frieberger, chief executive of 888 Holdings, said: "We are disappointed that the board of William Hill did not share our vision of the combined businesses. We believe that there was compelling industrial logic for the combination of these highly complementary businesses." Rank and 888 said a combination of the three business could have resulted in £100m of cost savings a year and would have created Britain's "largest multi-channel gambling operator". The withdrawal has broken a wave of consolidation in the gaming industry. Paddy Power is merging with Betfair, Ladbrokes is combining with Coral and GVC Holdings has taken over Bwin.party. 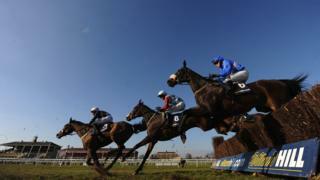 Shares in William Hill closed 1.5% lower at 303.1p and Rank ended the day down 1% at 221.6p. However, 888 Holdings shares jumped 2.37% to 205p.